The Heart of Scotland Trail is a delightful long distance walk, connecting east and west with a series of river walks, forest tracks, hill climbs and country lanes. Starting in Perth city centre, the route follows the River Tay upstream into the heart of the remote Perthshire hills and countryside as it meanders through the regions historic towns and villages. The trail then traverses the wilderness of Rannoch Moor towards the dramatic mountainous landscape of Glencoe and the famous West Highland Way, before arriving in Fort William under the shadow of Scotland’s highest mountain, Ben Nevis. This 123 mile route boasts a stunning array of landscapes; from the gentle river banks of the Tay and the open hillside estate of Glenlyon, the stunning ancient woodlands of the Birks of Aberfeldy and Rannoch Forest, to the haunting peat bogs of Rannoch Moor; this is a walk which typifies the natural beauty of the Scottish Highlands. Accommodation, services and refreshments are strategically located from start to finish, providing opportunities for a comfortable and relaxing end to a tough day’s walking. EXCLUSIVE WAS GUIDEBOOK - We are delighted to include a detailed waterproof Guidebook within each Heart of Scotland Trail package - exclusive to WAS customers. Featuring Ordnance Survey map extracts and a step by step route description, this fully coloured guidebook will be sure to keep you on the right track (one per group booking). The trail starts in Perth City Centre on the banks of the River Tay. A local cycle route takes you along the riverside path, away from the city and into the Perthshire countryside. This gentle walk is the perfect way to start your epic journey across the heart of Scotland. From the village of Luncarty, the route follows heads through some rich farmland into the countryside, along an official national cycling route, before strolling into Bankfoot. The road from Bankfoot follows a country lane to Upper Obney farm, where the landscape suddenly changes from rolling farmland and countryside to jagged hillsides filled with bracken, heather and wild woodland. The pass across the Obney Hills is a wonderful introduction to the Highlands, with the beautiful views serving as a taster for the remainder of the walk. The path then weaves its way through the Tomgarrow Wood, along the Inchewan Burn and into Dunkeld & Birnam. This is a relatively short day’s walking but a wonderful route which will leave you desperate for more. The route away from Dunkeld leads to The Hermitage, a wonderful collection of some of Scotland’s oldest and tallest trees. The Falls of Braan are as picturesque as anywhere in the country and remain one of Perthshire’s most popular tourist attractions. From here, the route heads into Craigvinean Forest, a largely dense woodland across the moor which follows forest roads into Aberfeldy. A carpet of purple heather along much of this route adds to the outstanding beauty of the area. This section begins with a walk along a section of the Rob Roy Way, from the stunning Birks of Aberfeldy and the Moness Burn and up onto the hillside, providing unobstructed views of the valley below and the Munro of Schiehallion on the horizon. The path leaves the Rob Roy Way as it descends into the beautiful village of Kenmore, passing an array of fabulous properties on the way down. After a stop off at the Kenmore Hotel, the second half of the day heads north and climbs through the Drummond Hill Forest before leaving the woods on the west side and descending onto the quiet country road which leads into the hamlet of Fortingall. Upon arrival, why not spare a few minutes to visit one of the oldest living things in Europe, the Fortingall Yew Tree, thought to be over 5,000 years old. This stage represents the first real climb of the trail, reaching over 700 metres at the highest point. 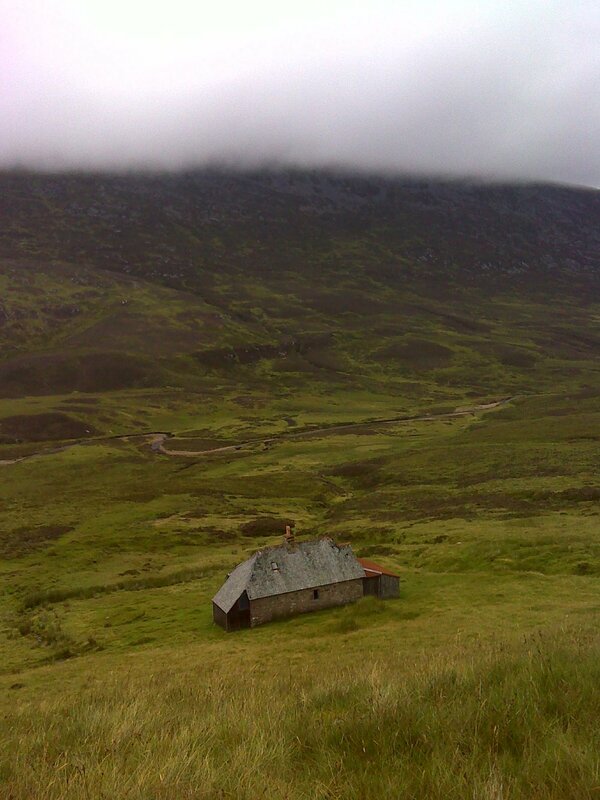 A typical highland landscape, the rough and barren terrain continues across the remote stretches of Glen Lyon, passing the Glenmore Bothy and into the shadow of the towering Munro of Shiehallion. This section required good map reading skills as the path is very faint and indistinct in places, particularly at the bothy. Once off the hillside, a country road leads to the village of Kinloch Rannoch. See below section on Deer Stalking and the Glenlyon Estate. 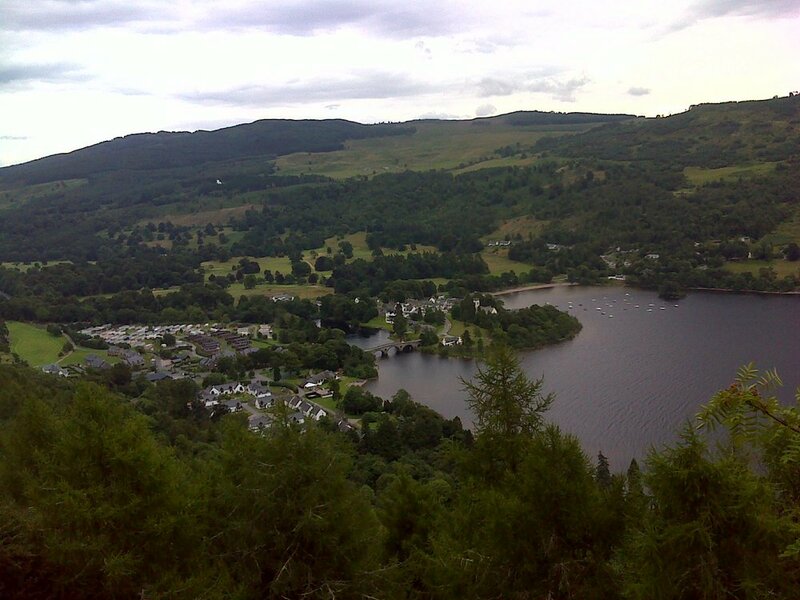 There are two options to this route, the first being a simple walk along the banks of Loch Rannoch on the country road. The second option, and much more rewarding, is the path which threads peacefully through the beautiful, ancient woodland of Rannoch Forest. This makes for a longer day, however is worth every step for which will undoubtedly be one of the highlights of the entire walk. Before reaching Bridge of Gaur, the route leaves Rannoch Forest and heads back into the open hillside and join’s the track which leads off the glen. This stage involves a short, five mile walk along the country road to Rannoch Station. The landscape quickly changes from the rich and colourful setting of Loch Rannoch to the boulder strewn, damp and desolate terrain of Rannoch Moor. As the road ends at the railway station, walkers are required to transfer their main, overnight bags on a short train journey to Bridge of Orchy, before returning to Rannoch Station for the next day’s onward journey across Rannoch Moor. This stage can be split into three distinct sections – the track which travels through the old forest, the boggy section through the heart of Rannoch Moor, and the land rover track which leads to the Kings House Hotel at the gateway to the Glencoe mountain range. Whether it’s the hauntingly quiet forest path, the faint track across one of Europe’s last remaining wildernesses, or the stunning backdrop of the spectacular West Highland mountain range, this stage really is like no other. This is where the Coast to Coast Trail meets the West Highland Way. The path heads straight through Glencoe, eventually climbing up and over the mountain range via the ‘Devil’s Staircase’, the highest point on the WHW. Once at the top, looking back down towards the Kings House Hotel, it pays to think how dramatically the landscape has changed from the lowlands of the Perthshire countryside. The path then follows a long descent into Kinlochleven. The final stage closes in on the Mamore mountain range as it climbs steeply out of Kinlochleven, where some of the best views of the entire walk can be found. Once this ascent has been cleared, the trail into Fort William is fairly level as it undulates along the old military road. As the path closes in on Glen Nevis, a number of forested areas are passed through, with Ben Nevis becoming more and more dominant on the horizon. A long forest track winds off the hill and into Fort William. Please note this walking holiday is available from mid-April to mid-August This is in order to avoid the beginning of the deer stalking season on the Glen Lyon Estate on 1st September. This package includes a one night stay in Fort William, however, additional nights at the end of the walk can be arranged to explore the highlands at your leisure, which could include a climb up Scotland's highest mountain, Ben Nevis. Walkers must organise their own return transport to Perth and beyond. Details of public transport services are available on request. If you would prefer to walk the Heart of Scotland Trail using an alternative itinerary, please let us know and will do our utmost to tailor the holiday to your needs. Many walkers choose to take rest days during the walking holiday; whether to give the feet a well-earned break, to do a little sight-seeing or perhaps a bit of ‘Munro-bagging’. There is also the possibility of staying on in Fort William to perhaps climb Ben Nevis or visit one of the many other tourist attractions in the area. If this option is of interest, please let us know on the booking form. Additional nights can be arranged from £40 per person per night. Each Hotel and Bed & Breakfast has been hand-picked to ensure you enjoy the most welcoming, comfortable and value-for-money experience on the Heart of Scotland route. A warm welcome awaits all walkers and hikers, with hotel owners keen to hear stories of the day’s adventures. Evening meals and packed lunches for the onward journey are available at most hotels and B&B's, however, please note that they are NOT included in the holiday package. The route is not way marked or signposted, other than the stages which follow the Rob Roy Trail and the West Highland Way. The route follows narrow paths at times, some of which can be obscured by overgrown heather, bracken and other Highland undergrowth. For this reason, we must insist maps and a compass are carried at all times. As well as the Guidebook, your package includes detailed Ordnance Survey maps of the entire route. WAS highly recommend that at least one member of your party is a competent map and compass reader. Unfortunately, due to restrictions imposed by some places of accommodation, dogs are not permitted on this walk. Unlike the West Highland Way, there is no single dedicated baggage transfer service along the Heart of Scotland Trail, however, we have arranged for local transport operators and hoteliers to provide an equivalent service, ensuring your heavier bags will be transferred and delivered safely to your next place of accommodation. IMPORTANT NOTE: There is no direct road link between Rannoch Station and the Kings House Hotel, which makes the transfer of bags from door-to-door, at this stage, a more complicated task. At WAS, we do not want to burden our walkers with the prospect of carrying their own heavy bags across Rannoch Moor. Our solution to this problem involves a short train journey from Rannoch Station to Bridge of Orchy, where the WHW baggage transfer operators will collect the bags and take them to your next destination. More details can be found in your detailed daily itinerary. Although travel to Perth and from Fort William is not included in the holiday package, we are more than happy to provide details of public transport services. To Perth – There are excellent train and bus services, allowing easy access from Glasgow and Edinburgh to the south, and Inverness and Aberdeen from the north. From Fort William – The main routes out of Fort William is by bus and train to Glasgow. The journey, whether by rail or coach, is an absolutely glorious trip with stunning scenery throughout. This really is the perfect way to end a memorable holiday. Please note that; as there are some sections of this route which pass through remote hills, forests and countryside, the minimum group size for this holiday is two people. The safety of our walkers is of the utmost importance and we would not want to risk the possibility of a solo walker becoming injured or disorientated in an area where there are no other people around to help. Scotland has fantastic hill-walking opportunities, but summer and autumn are also important times for deerstalking,which supports the local economy and is essential for sustainable deer management. The following options offer some advice to help walkers and land managers have a great day on the hill.